Two American filmmakers/artists talk about the challenges and rewards of making films about women living their daily lives in Cairo and Damascus. Each of the films, made in very different styles, chronicle a period right before Egypt and Syria were gripped by revolutionary turmoil. Short clips from each film will be shown in advance of the discussion. The participants include artist Judith Barry on Cairo Stories (Egypt) (info-duration) and director Julia Meltzer on The Light in Her Eyes (Syria, Info-duration, co-directed with Laura Nix), with moderator Sarah Gualtieri, author of Between Arab and White: Race and Ethnicity in the Early Syrian American Diaspora and Director of the Middle East Studies Program at USC. Seating is limited, tickets are $15, $10 students/members. Judith Barry’s Cairo Stories continues her Not Reconciled series where she investigates the construction of subjectivity, history and identity in countries and cultures around the world. She recently presented videos and photographs at Rosamund Felsen Gallery from her latest series, …Cairo Stories, and some of these, in Arabic and English, will be shared with the audience on April 24th. Through collaboration with Cairene women from many different backgrounds, these stories focus on the negotiations women make across Cairo’s social, cultural and economic life and illuminate the complex systems, allegiances and political stratas that inform their daily lives. Barry conducted the interviews in Cairo between 2003 and 2011. In exploring the experiences of Cairene women—Cairo being one of the centers of the Middle East—notions of representation, history, and subjectivity are brought to the fore. These stories, retold by actors, underscore the fact that all stories, even ones we tell ourselves, are ultimately fictions, while maintaining the emotional impact of each of these individual woman’s life. Three of Judith Barry’s works are currently on view as part of the Hammer Museum’s exhibition Take It Or Leave It: Institution, Image, Ideology through May 18, 2014. Julia Meltzer’s documentary The Light in Her Eyes on Syria recounts the life of Houda al-Habash, a conservative Muslim preacher, who founded a Qur’an school for girls in Damascus 30 years ago. Every summer, her female students immerse themselves in a rigorous study of Islam. A surprising cultural shift is under way-women are claiming space within the mosque. Shot right before the uprising in Syria erupted, The Light in Her Eyes offers an extraordinary portrait of a leader who challenges the women of her community to live according to Islam, without giving up their dreams. For the past few years, Judith Barry has been working on a Cairo version of Not reconciled, an ongoing series of “as told to” stories that she has collected over a period of 15 years in a variety of countries and cultures. Not reconciled: Cairo Stories began with an invitation from the Townhouse Gallery in Cairo, and has developed through collaborations with Egyptian women from the American University in Cairo and various NGOs in the city. The stories that have been collected touch on the Nasser and Sadat periods as well as current events, but they focus on the negotiations that women in particular must make within Cairo’s cultural and economic life, emphasizing the complexities of family life, allegiances and questions of class, and the very particular sense of place embodied by Cairo’s inhabitants. The Cairo Stories project extends and expands two significant threads of her work: the investigation of how notions of “history” and the “construction of subjectivity” are performed and documented within the context of specific places and cultural conditions; and the exploration of how art, architecture and technology (particularly innovative uses of animation and compositing) can intersect to create aesthetic and critical discourse in the public realm. Otis Graduate Public Practice Program and USC MA Curatorial Program are co-presenting an informal discussion with Judith Barry on her current Los Angeles exhibitions. The conversation will be moderated by Rhea Anastas, USC’s Director of the MA Curatorial Program, and Karen Moss, art historian, curator and writer, who teaches in both programs at Otis and USC. Three of Barry’s works are also currently on view in the UCLA Hammer’s Take It or Leave It: Institution, Image, Ideology through May 18th. Archive available on April 16, 2014 as …Cairo stories. £8.50/£6.50 concession (£6.80 Whitechapel Gallery Members/£5.20 Whitechapel Gallery Concession Members ). *Proof of concessions and membership to be shown on the door. 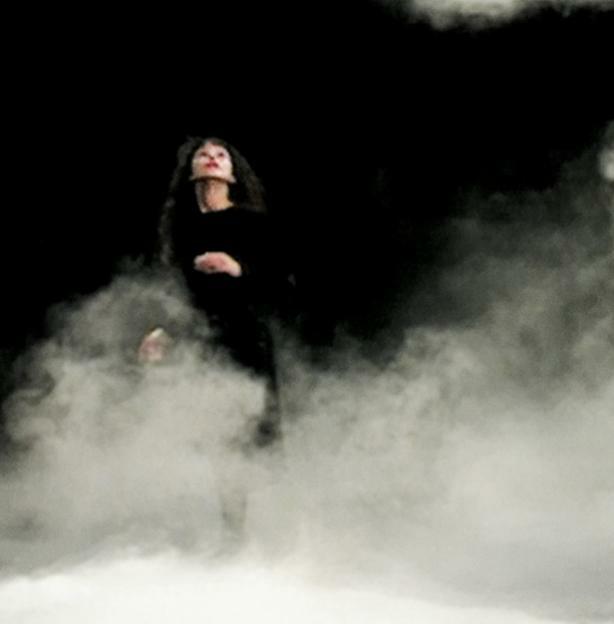 Artist Judith Barry, a pioneer of video art, discusses and screens a series of her artworks in this rare UK event. She will be joined by esteemed writer Jean Fisher and together will discuss the complexities of using the voice as a form of political representation through film, video and installation. The conversation will be led by Curator Omar Kholeif. This talk considers questions such as, how has the voice been manipulated and contorted through media? Can the voice be considered a bearer of an ultimate truth, or as a subversive counterpoint? The discussion also considers the voice’s relationship to feminist discourses and its distribution through new technologies. Take It or Leave It: Institution, Image, Ideology is the first large-scale exhibition to focus on the intersection of two vitally important genres of contemporary art: appropriation (taking and recasting existing images, forms, and styles from mass-media and fine art sources) and institutional critique (scrutinizing and confronting the structures and practices of our social, cultural, and political institutions). The exhibition brings together works by thirty-six American artists who came to prominence between the late 1970s and the early 1990s. The majority of the works on view are from the 1980s and 1990s, a groundbreaking period that was shaped by the feminist and civil rights movements of the previous decades. Conscious of the profound impact on society of mass media such as television, newspapers, and film, artists examined critical questions of identity and representation via politically and socially engaged practices. This era witnessed a number of significant events that reverberated in the art world: the AIDS crisis; Ronald Reagan’s “trickle-down” economics and the subsequent recession; the fall of the Berlin Wall and the end of the Cold War; among others. Expanding on the work of earlier conceptual artists, who were committed to exploring the very definition of art, the artists featured in Take It or Leave It believe that art cannot be fully understood or experienced without acknowledging the contexts in which it is produced, viewed, and distributed. They point to the links between art institutions and the other organizations that make up our society, asserting that to separate art from aspects of our daily experience—whether education or medicine, marriage or war, parenting or advertising—is to reinscribe arbitrary and false divisions between art and society, between our aesthetic lives and our everyday lives. Although Take It or Leave It is a historical show focusing on a period in the recent past, it also includes recent work, arguing for the continued relevance of these artists’ practices and also revealing their sustained commitment to both historically recognizable and emerging strategies of appropriation and institutional critique. The exhibition highlights dynamic practices in notably diverse mediums, including painting, sculpture, installation, photography, video, text, and performance. The works are by turns subtle and aggressive, poetic and didactic, emotional and intellectual. They are as challenging as they are rewarding, as radical as they are rational. Take It or Leave It seeks to revive and participate in the meaningful debates that the artists have fostered over time and to instill a desire for critique, in its many forms, to remain a cornerstone of American art. Artists featured in the exhibition: Judith Barry, Gretchen Bender, Dara Birnbaum, Nayland Blake, Tom Burr, Mark Dion, Mark Dion & Jason Simon, Jimmie Durham, Andrea Fraser, Robert Gober, Felix Gonzalez-Torres, Renée Green, Jenny Holzer, Mike Kelley, Mary Kelly, Silvia Kolbowski, Barbara Kruger, Louise Lawler, William Leavitt, Zoe Leonard, Sherrie Levine, Glenn Ligon, Paul McCarthy, Allan McCollum, John Miller, Matt Mullican, Cady Noland, Adrian Piper, Stephen Prina, Martha Rosler, Haim Steinbach, Rirkrit Tiravanija, Christopher Williams, Sue Williams, Fred Wilson and David Wojnarowicz. Take It or Leave It is organized by the Hammer Museum and co-curated by Anne Ellegood, senior curator at the Hammer Museum, and Johanna Burton, Keith Haring Director and Curator of Education and Public Engagement at the New Museum. Take It or Leave It: Institution, Image, Ideology is made possible by a major grant from The Andy Warhol Foundation for the Visual Arts. Generous support is also provided by The Audrey and Sydney Irmas Charitable Foundation, the LLWW Foundation, Karyn Kohl, the National Endowment for the Arts, Agnes Gund, and an anonymous donor. Support for the Barbara Kruger installation is provided by The Broad Art Foundation. collaboration with Cairene women from many different backgrounds, these stories focus on the negotiations women make across Cairo’s social, cultural and economic life and illuminate the complex systems, allegiances and political stratas that inform their daily lives. These interviews, conducted in Cairo between 2003 and 2011, took place in both English and Arabic, as do the stories on view in the gallery. 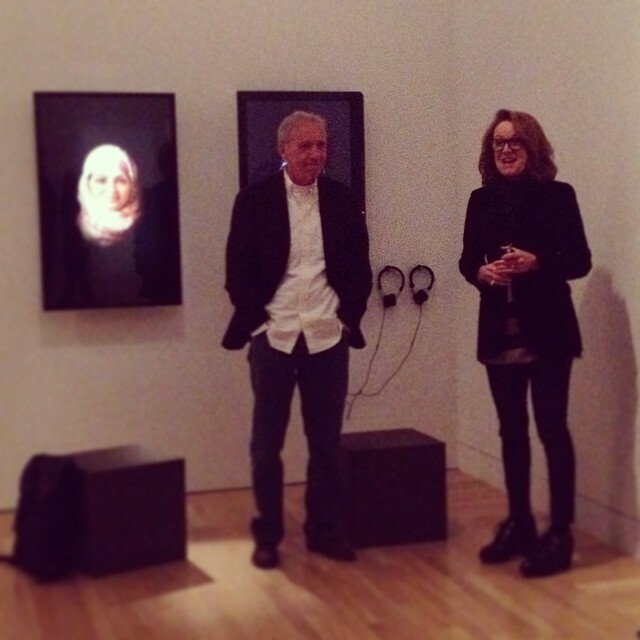 Hammer Museum director Annie Philbin introducing the director of Townhouse Gallery in Cairo, William Wells, before his FlashTalk on Judith Barry’s ‘…Cairo stories.’ 2014. Judith Barry’s …Cairo Stories focuses on personal stories told to the artist by women of different backgrounds that she interviewed in Cairo between 2003 and 2011. Speaking to the women about Cairo’s social, political, and economic systems and how they inform their daily lives, the interviews were conducted in both English and Arabic and later turned into scripts and retold using actors. 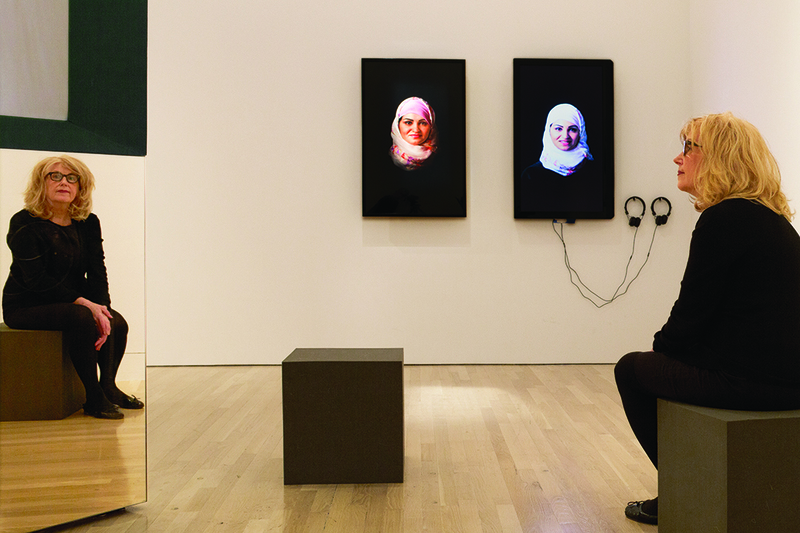 Resulting in both still photographs and videos, the work has been shown in a variety of ways, including its current incarnation as part of the exhibition Take It or Leave It, currently on view at the Hammer Museum, and a more expansive version currently on view at Rosamund Felson Gallery in Santa Monica. …Cairo Stories is part of a larger body of work, …Not Reconciled, which explores the construction of subjectivity, representation, and history. …Cairo Stories grew out of the artist’s experiences representing the U.S. at the Cairo Biennial in 2001 and at Townhouse Gallery in Cairo. As the founding director of Townhouse, William Wells will give us a glimpse into the genesis of the project and working with Barry as well as the general social and political situation for artists in Cairo over the time period of the project and today. William Wells is the founding director of the Townhouse Gallery in Cairo, Egypt. Established in 1998, Townhouse and Wells have grown to be integral to the emergence of Cairene contemporary art on a world stage and the integration of international contemporary art locally in underserved areas of Cairo. Townhouse was established in downtown Cairo in 1998 as an independent, non-profit art space with a goal of making contemporary art and culture accessible to all without compromising creative practice. Townhouse supports artistic work in a wide range of media through exhibitions, residencies for artists, curators and writers, educational initiatives and outreach programs. By establishing local and international relationships, as well as diversifying both the practitioners and audiences of contemporary art, Townhouse aims to support and expand the knowledge, appreciation and practice of contemporary arts in Egypt and the region.